Beets. They’re very much a “love ’em or leave ’em” vegetable. Speaking for myself…I could happily eat them any day of the week. I love their deep vibrant color, firm texture, and magnificently earthy flavor. When a menu features a beet salad, you’ll more than likely see it being delivered to my table. This Roasted Beet and Arugula Salad with Balsamic Dressing comes from Michaela, an architect and principal at SALA Architects, where I have worked for the past 13 years. 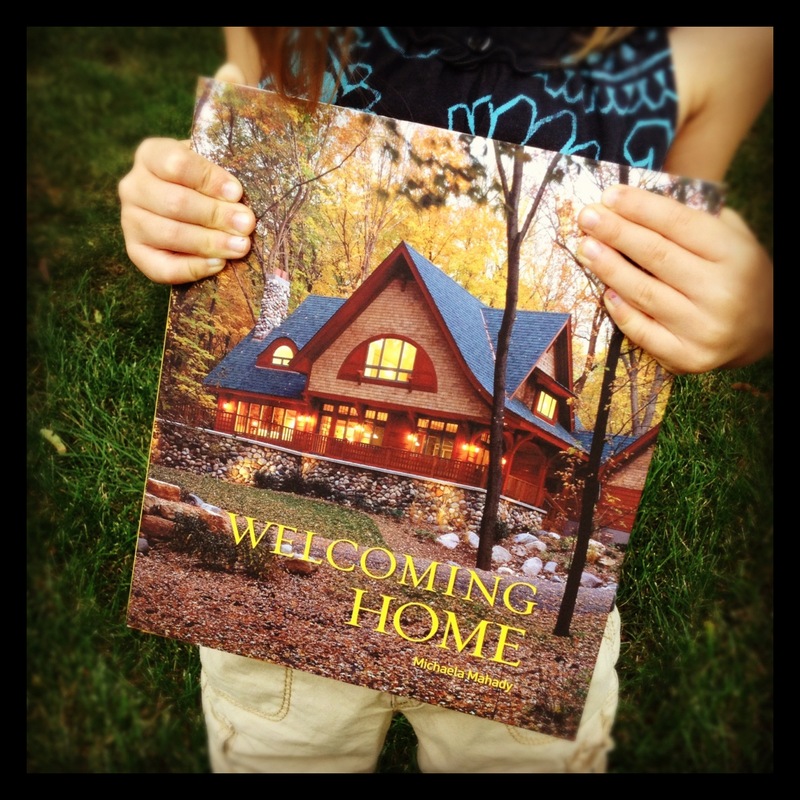 Maple Forest graces the cover of Michaela’s book, appropriately called Welcoming Home. When I think of creatively gifted people, Michaela is up near the very top of the list. 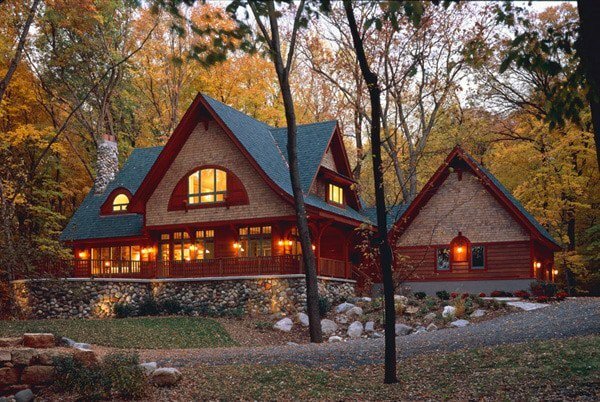 Besides being a highly successful architect, designing welcoming homes and commercial spaces across the United States, she also designs amazing art alongside her husband at Pegasus Studios. Beyond that, there’s a whole slew of other fancies and hobbies she entertains as well… She has an amazing green thumb and a garden full of crazy huge hostas, handwriting so flattering that it’s graced wedding invitations and computerized fonts, and a natural knack for knitting intricate sweaters without a pattern. And when it comes to dinner parties, Michaela has infinite flair. She visits Italy regularly with family and friends, and it’s obvious that she holds that country very close to her heart. Even though I’ve never been to Italy (on my bucket list! ), I can feel its presence when Michaela entertains. From the music, wine, and laughter, to the simply prepared dishes bursting with fresh Italian flavors, spending time around Michaela’s inviting table is a true treat. It was at Michaela’s home where I was introduced to her beet and arugula salad, a great big platter full of fearless flavor. The dish instantly intrigued me visually, with its varying textures and colors layered just so. With a drizzle of bold balsamic dressing and a sprinkling of salty blue cheese and candied pecans…I really had never seen anything like it. And once I tasted it, I knew my love for beets had been elevated to a new level. This salad is hearty enough to be served as a main course for lunch, with a basket of warm fresh bread. It also works beautifully for a large group and makes an impressive appearance in a buffet line-up. 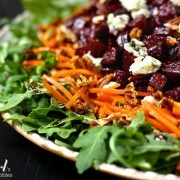 If you’re up for a new way with beets, I’m tellin’ ya, Michaela’s salad is the way to go! 8 c. cubed (about 1/2”) beets, from about 4 to 5 large beets (you could also just slice the beets into 1/4” rounds) It seems like alot of beets, but they shrink down. Preheat oven to 375°. On a rimmed baking sheet, toss the beets with the olive oil, honey, salt, and pepper. Roast for 20 minutes and then stir. Roast an additional 20 minutes, or until beets are softened and starting to caramelize. Remove from oven and let cool. The beets can be roasted a day ahead of time and chilled. Briskly whisk together all the ingredients for the dressing. This can be prepared a day ahead of time. On a very large platter, evenly spread the arugula. Leaving a border of arugula around the outside of the platter, spread a layer of carrots over the arugula. Now leave a small border of carrots and pile the beets on top of the carrots, in the very center. You want to see all the layers distinctively. Sprinkle with blue cheese and candied pecans. Add more salt and pepper, if desired. Drizzle a bit of the dressing over the top of the salad and serve the remainder of the dressing on the side. 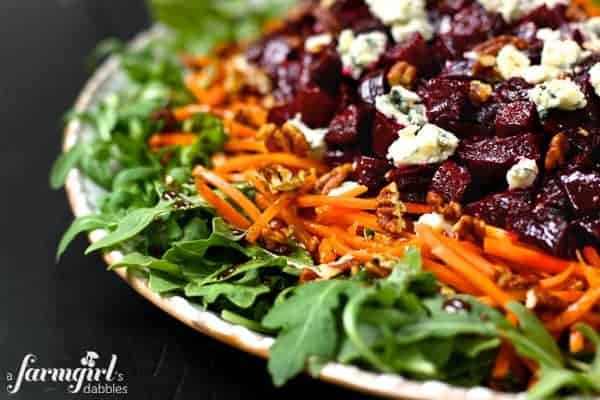 * Please note that the beets are intensely colored and will bleed into the carrots and blue cheese after the salad sits for awhile. Which isn’t a big deal. But…if you want the salad to be as fresh looking as possible at serving time, wait to layer the salad until right before serving. It’s very easy to have all the individual portions of this salad prepared up to a day prior to serving. Slightly adapted from Michaela Mahady’s recipe box. Do you have a favorite recipe or way to eat beets?